We’ve been working on the history of Northeast Portland’s Fernhill Park this week, and it’s a fascinating tale of the city’s growth during the mid-20th Century, land use change, local politics and community engagement. But we bumped into a story along the way that we have to share first because it’s going to be the next one that goes away and we have to appreciate it briefly while we can. NE 42nd and Holman, looking east, April 2017. In the mid-1940s, this was a community of returning WWII servicemen and their families, temporary workers and others passing through the Portland area. The former Spur Tavern, built in 1942, 6300 NE 42nd Avenue. These buildings have obviously known better days. 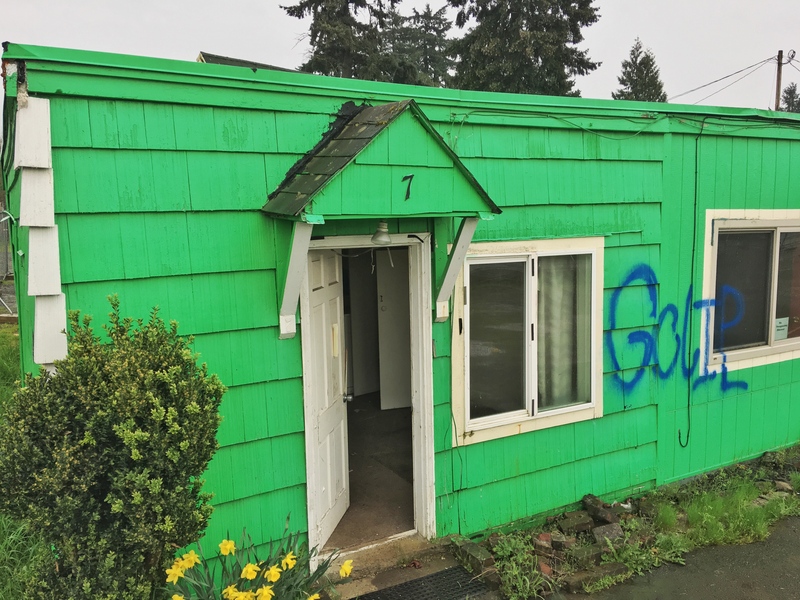 Some might call them an eyesore, with broken and boarded up windows, tilting roofs and doorways and rotting siding, all spray painted with graffiti. A small ocean of cracked and buckling pavement and gravel surrounds it all, moss growing everywhere, branches down, junk piled. And for the moment it’s surrounded by barbed wire fence. When you see fence go up around buildings like this, you know things are about to happen. 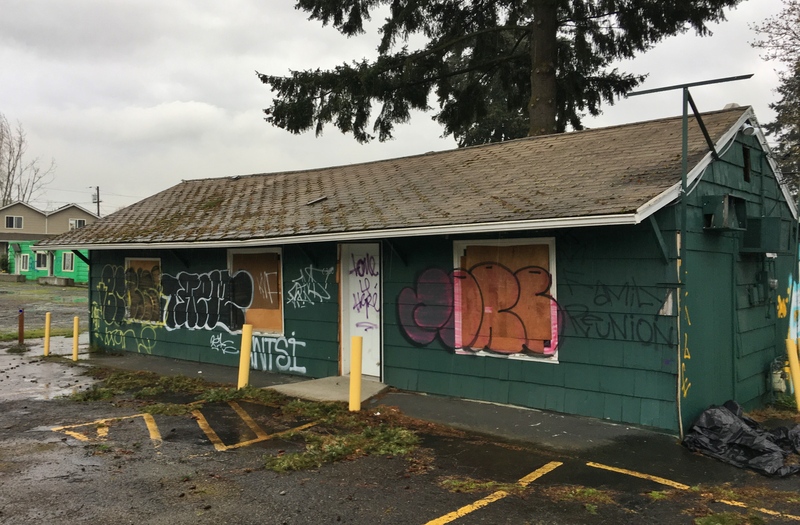 In fact, this week the City of Portland issued a demolition permit, so if you want to go look, make it quick. We haven’t yet been able to connect with the owner, so we’re not sure what’s planned for the property. But we’re guessing most people are probably not going to miss these tired and dejected looking buildings. Built in 1942, about the time NE 42nd Avenue was connected up to Columbia Boulevard and the new Portland airbase, the “Tourist Cabins” and Spur Tavern provided a sought-after home base for servicemen and their families on short assignment and others who needed temporary quarters for seasonal jobs or as a jumping off place into the next chapters of their lives. When it was first built, from the front door of the Spur you could look out at agricultural fields in every direction. 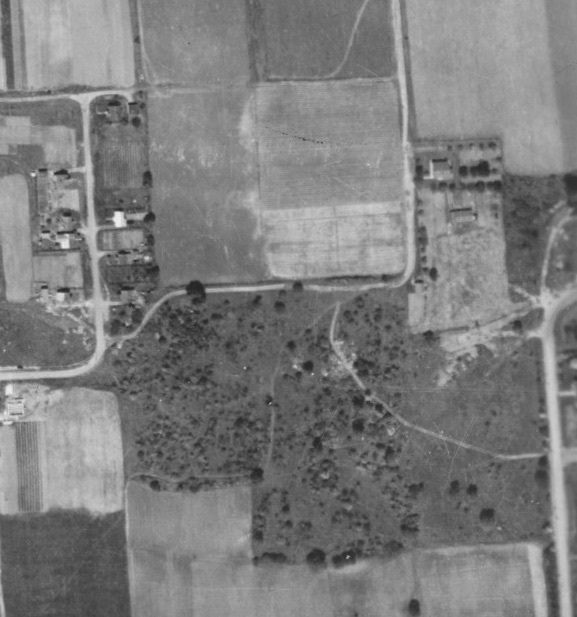 The Cully neighborhood to the south and east was already established and growing. Off to the west, across the open fields of what is today’s Fernhill Park and the eastern edge of the Concordia neighborhood, you could see the Kennedy School. To the north, more farm fields and dairies around the Columbia Slough and a beehive of activity at what was fast becoming the Portland Air Base and the new Portland airport. The close-in fields and orchards were the livelihood of local families. One family of immigrants from Croatia lived in a 1917 farmhouse at the corner of today’s NE 41st and Highland Street (there was no Highland Street then). Home to the Anna and Josef Ugar family, this farm residence was completely surrounded by fields and orchards, with the nearest neighbor a quarter mile off to the west. You get the idea: this was the outskirts. One young person who knew this place well and loved it for the adventure, family and community it provided, was Mike Brink, grandson of Anna and Josef Ugar. Mike split his growing up years between his grandparent’s farmhouse just to the west on the hill overlooking the fields, and the “cabin” at the far north end of the line of connected apartments. Mike’s dad Bill was from Cascade Locks. In the 1930s, while helping build Bonneville Dam, Bill married Kay Ugar. After Mike was born, Bill shipped off to World War II, so young Mike and his Mom Kay headed home to the Ugar family farm in Northeast Portland. When his dad returned from the service, the young family stayed local, moving across NE 42nd Avenue to rent one of the tourist cabins. Mike recalls the modest means of many cabin residents, and how from time to time when rent was hard to come by, the landlord Al Druery, who also ran the Spur Tavern, would cover a family who needed help with groceries until payday. Cabin # 7, 6300 NE 42nd Avenue, April 2017. Note the daffodils by the front door, a remnant of more optimistic times. I still remember V-J Day. I was playing catch with my friend Bobby Collins in front of the cabins and traffic on 42nd Street got very heavy with many cars going very fast in both directions, the drivers honking their horns and people hanging out the windows and yelling. I’m sure you know 42nd was the main axis route to the air base. It scared the hell out of me. I ran in the house (cabin) and my mother had the radio on and told me the news. Thanks for the memories, Mike. We’ll hold onto these so the future can remember the past. Brings back memories of my Portland childhood, (1939-1949), not at this particular site, but in Guild’s Lake. The old furniture and fold-out beds, the tiny water closets, the crummy kitchen with its icebox and 2-burner stove. There were filled ashtrays everywhere and the continuous bottles of wine ready to be brought to table when neighbors showed up – families got along with very little in those days and yet there was a sense of community sharing too. The return state-side of so many soldiers who hadn’t seen their families for years was quite traumatic for some of the mothers who had enjoyed the freedom of not having to keep house for a bitter old man who sat around and drank. Many men had serious PTSD during and after WW-2. Thanks for posting. I turn onto 42nd from Holman almost daily and all I ever thought was how bad those buildings looked. I never considered that they too have a history and once played a part in the daily lives of people in NE Portland. The connection to returning vets and their families is very interesting and I never even knew of the Spur Tavern. I always look forward to your posts. I enjoy learning about the history of the area and I am especially excited for the upcoming piece on Fernhill Park. Great story and once again what excellent research! I so appreciate Mike’s recollections. It’s too bad the property fell into complete disrepair – sad really when there are so many without housing. It reminds me of some of the early motor lodges. Thanks for this bit of history.